The Maker Faire UK has just happened in Newcastle – April 25th & 26th 2015. There were around 120 Makers in the Life Centre, with talks and performances also happening. It was really busy, with more than 10,000 attendees over the weekend. The Makers are a friendly and enthusiastic bunch of people and the stalls were busy, with a lot of chatting going on. There were a lot of things to make, do and play, and it catered for all age groups. There were a lot of tweets with the hashtag #MakerFaireUK if you want to check it out on Twitter. 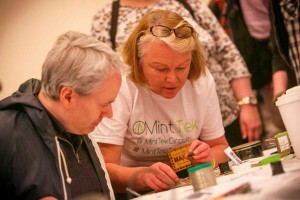 Mint Tek ran a workshop at Maker Faire UK to demonstrate how it easy it is to assemble SMD (surface mount devices) onto printed circuit boards. The design was a simple flip flop circuit, designed by Paul Foran – the end result was a flashing badge. We thought the workshop would be popular with children but it turned out that lots of adults were really keen to try it out! SMD technology has facilitated slimmer, more compact hardware designs. Most hardware enthusiasts either shy away from SMD and use through-hole components or try to hand-solder the SMD parts. Take it from us, hand-soldering SMD parts is very time consuming and can wreak havoc on fingers. Our young participants had the good eyesight to see the polarity of the LEDs, us older folk needed the help of a loupe, but it was manageable. While steady hands were also useful the PCB was robust enough to allow corrections. The process was to take a board, place a stencil over it and cover the stencil with solder paste. The stencil ensured the paste only landed on the pads of the board, where the components were to be placed. Next the stencil was removed and, using a tweezers, the components – LEDs, resistors, capacitors and transistors – were placed on the board. Then the board was placed in a common or garden toaster oven. The beauty of our workshop was the Reflow Controller from Reflowster. The guys at Reflowster have a really neat and compact solution to reflow soldering and we put it through its paces at the Maker Faire UK. In order to properly connect the components to the pads, the solder paste must undergo a process called reflow. Reflow is where the paste is melted using controlled heat to permanently make the connection. The Reflowster controls the temperature of the toaster oven resulting in excellent connections and less burnt fingers. Once the PCBs had cooled, we soldered on a battery holder, put in the battery and, hey presto, a working circuit and flashing LEDs. We had a few adventures; the strangest was when it turned out that the green LEDs had a different polarity to the red. We had no way of knowing which was which and it resulted in a few dud badges. Apologies to anyone who experienced that. Thanks to Paul Killan at the University of Newcastle and to the nice lady from Bioinformatics in Newcastle who solved the problem. All in all it was a great weekend – we saw, we learned, we made. Not bad for a wet weekend in April! 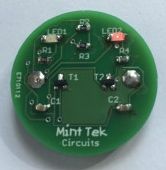 Georgina is a co-founder of Mint Tek Circuits.